Mega Sale! Up to 24% off on Card Boxes at My Natures Treasures. Top brands include Hayley Cherie, & Creative Converting. Hurry! Limited time offers. Offers valid only while supplies last. 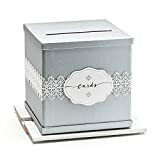 Hayley Cherie - Silver Gift Card Box with White Lace and Cards Label - Silver Textured Finish - Perfect for Weddings, Baby Showers, Birthdays, Graduations - Large Size 10" x 10"